The United Nations human rights office today voiced concern over last week’s murder of an outspoken Cambodian environmental activist and human rights defender, whom it said had worked fearlessly to expose illegal logging and corruption in the country. Chut Wutty was shot and killed last Thursday in south-western Cambodia, according to Rupert Colville, a spokesperson for the Office of the UN High Commissioner for Human Rights (OHCHR). A member of the Cambodian gendarmerie was also killed in the incident. “Despite the current lack of clarity about what exactly happened, we are very concerned that the killing of Mr. Wutty marks the latest and most lethal in a series of gun attacks on human rights defenders in Cambodia,” Mr. Colville told reporters in Geneva. The OHCHR office in Cambodia has, since the beginning of the year, investigated four other cases involving the use of live ammunition against communities and human rights defenders, which resulted in a number of injuries, he added. Mr. Wutty’s killing occurred in a forest in Koh Kong Province where, accompanied by journalists, he was gathering evidence on illegal logging. 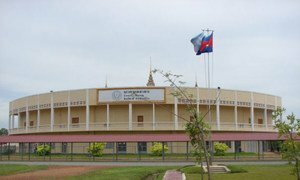 The OHCHR office in the capital, Phnom Penh, dispatched a team to the province two hours after the shooting to investigate the incident. It visited the site of the shooting, interviewed residents and monitored the post-mortem examination of the bodies. “We welcome the fact that the authorities have commenced investigations into Thursday’s shooting, including a military investigation,” said Mr. Colville, noting that OHCHR has urged the Cambodian Government to ensure that a full civilian judicial investigation proceeds quickly and with utmost probity and independence. “We also urge the Government to take concrete and immediate measures to ensure the safety of all witnesses and investigators as well the families of the deceased men,” he added. Secretary-General Ban Ki-moon has decided to initiate a selection process for new international judges for the United Nations-backed Cambodia genocide tribunal, and stressed that the Government must provide full cooperation so they can carry out their duties.